The group American Muslims for Palestine (AMP) does not shy away from its support for the terrorist organization Hamas. 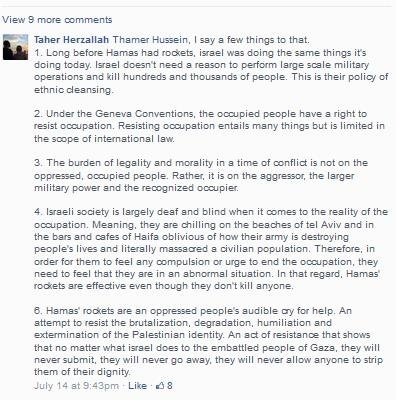 The group's National Campus Coordinator, Taher Herzallah, recently posted Palestine TV photos of injured Israeli soldiers and a destroyed tank to his personal Facebook page. The caption for both photos read: "The most beautiful site in my eyes." It appears that this post has been removed. Herzallah proudly lists being part of the 'Irvine 11', a group of students arrested after orchestrating a plan to shut down a speech by then-Israeli Ambassador Michael Oren's 2010 speech at UC Irvine, in his biography. 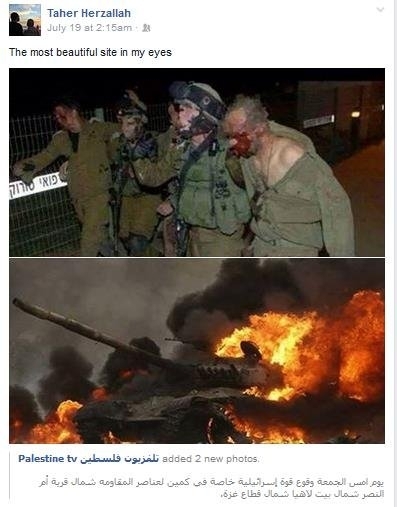 In another recent Facebook comment, Herzallah justified Hamas rocket fire aimed at Israeli civilians, saying that "in order for them [Israeli society] to feel any compulsion or urge to end the occupation, they need to feel that they are in an abnormal situation. In that regard, Hamas' rockets are effective even though they don't kill anyone." Israel unilaterally withdrew from Gaza in 2005. It imposed a blockade on the territory after rocket fire targeted its civilians, in an attempt to stem the flow of weapons and bomb-making material coming in. American Muslims for Palestine (AMP) was formed in 2006 as a nonprofit organization based in Chicago with chapters around the country. Its message omits any mention of peaceful coexistence with Israel, and routinely includes calls for an end for U.S. aid to the Jewish state. The AMP is a founding member of the new U.S. Council of Muslim Organizations, joining the Council on American-Islamic Relations (CAIR), the Muslim American Society (MAS) and the Islamic Circle of North America (ICNA). In April, AMP hosted a fundraiser dinner praising Rasmieh Odeh, a women directly responsible for two deaths in an Israeli grocery store bombing. Odeh was indicted in October and charged with naturalization fraud after failing to disclose her arrest and subsequent imprisonment in Israel for her role in the 1969 bombings by the Popular Front for the Liberation of Palestine. Other event speakers included a Muslim Brotherhood leader in Jordan who led a Hamas-propaganda arm in the United States and a man listed as a member of the Palestine Committee, the Muslim Brotherhood's umbrella organization of US-based Hamas-support groups. Previous conferences featuring AMP speakers demonstrate the group's radical tendencies with AMP officials repeatedly calling for grassroots efforts to delegitimize Israel in the U.S. and promote Palestinian "resistance." Click here for more examples of AMP's support for Hamas. I was at the Oren event. It was disgusting. These self-annointed martyrs attempted to deprive some 300 mostly elderly Jewish folks of the chance to hear the Israeli ambassador speak. They were rightly prosecuted and convicted. In 2012, three of them returned to UC Irvine to speak as part of the annual anti-Israel week of events hosted by the Muslim Student Union. During the q and a, I pointed out to them that they were speaking without any disruption and asked them why they could not afford that right to those with whom they disagreed. They proudly answered that Oren was a "war criminal", and that if he ever returned to UCI, they would do it again. One of those three speakers was Taher Herzallah. Gaza is an occupied and oppressed land. It is occupied and oppressed by Hamas. Under total control by Hamas for 7 years, why have so few people, if any, had their living conditions improve. Gaza has received enough building materials to properly house tens of thousands if not one hundred thousand people. Instead they built a thousand tunnels some big enough to drive a truck through. Not enough water. How much water has been used to mix all that cement for these tunnels. Can't pay their gov't workers. Maybe the tens of billions in aid they've received from UN, US, EU and others shouldn't gave gone to buy rockets, rocket launchers and other weapons. How many billions have the Hamas leaders stolen and put in personal European accounts. According to Mahmoud Abbas, Arafat stole $3-4 billion, which is why after Arafat died, the PA sued Arafat's widow in France to recover the money. Hamas leaders can probably retire quite comfortably themselves. If Israel's goal is ethnic cleansing and genocide, why do the Palestianians think that Human Shields will work?? There is no statue of limitations on sedition and treason. There is no statue of limitations on sedition and treason. So these guys live with apprehensions because soon as real Muslims find an isolated place they'll put these Americans down and earn their ticket to their heaven.